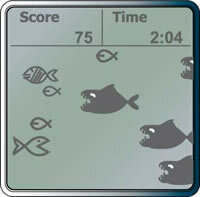 The Fish Game teaches you how to modulate intensity. The object of this game is to rack up as many points as possible by eating the nutritious fish while avoiding the large, toothy beasts that will send your score plummeting to the ocean floor. 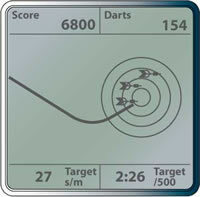 Target Training is similar to Darts in that the object of the game is to hit as many bull’s-eyes as possible by maintaining a consistent pace and tempo. 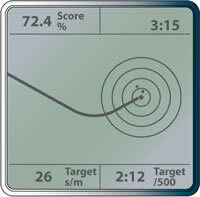 Target Training differs by allowing you to set your targets for pace and tempo. Target Training offers two modes of play: Just Play and Advanced. Biathlon combines two sports: typically Nordic skiing and target shooting. Races generally consist of three or five laps, with a shooting stage (“range”) between each lap. A penalty is assessed for each missed shot. Most often, this is a penalty lap of 150 extra metres of skiing. 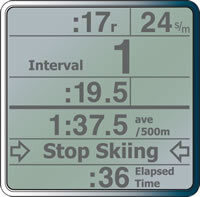 You can use the Biathlon Game to ski or row intervals alternating with target shooting or some other activity. The powerful capabilities of the Performance Monitor allow it to talk directly to a computer or mobile device, and there are a number of software programs available for use with the PM5. Below is a selection of some of our most popular programs.